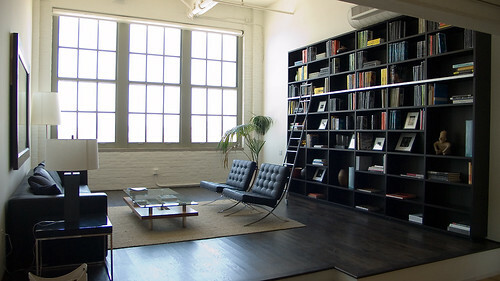 penthouse loft unit in the downtown LA biscuit company building built in the 1920's. the huge original windows are at a normal height only with a raised platform in the living area. with a shorter average height of the people almost 100 years ago, perhaps the purpose of the windows was not for the workers to look out? the neighbor below you is separated by 6 feet of concrete floor. original brick wall is probably too out of shape, so they are painted white. interestingly, both the barcelona chairs and the building are from the 20's.